…and then started posing for the camera in a manner way too reminiscent of Cuzco! Yesterday was festive. It was a beautiful sunshiny day (a bit too windy, but I guess we can’t have everything). No girls are in heat right now (three should hopefully be bred), so I was able to let everyone out to play together. 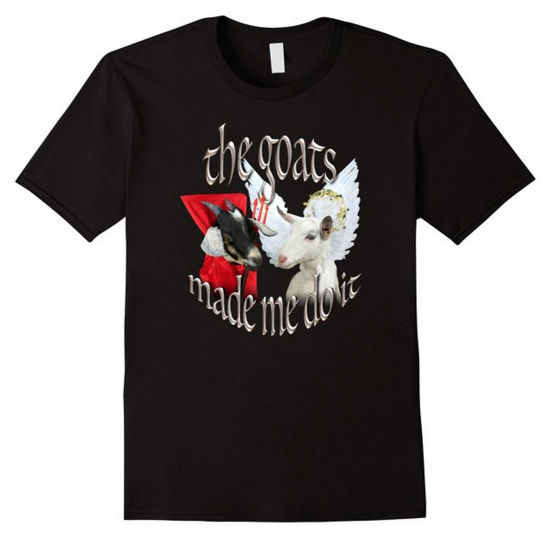 All the goats got a little something for Christmas. I bought a bag of overripe bananas and a big box of powdered donuts. 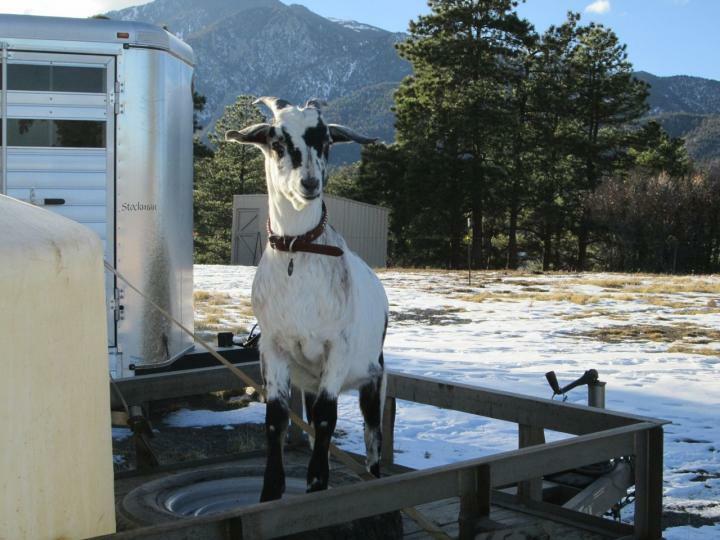 The donuts were not a universal hit, but the goats who like them are NUTS over them (*cough*Cuzco *cough*). Their enthusiasm more than makes up for the ones who would rather stick with animal crackers. I almost bought Daisy a box of dog biscuits for Christmas until I remembered that she’s as crazy for donuts as Cuzco. Made my shopping easier! 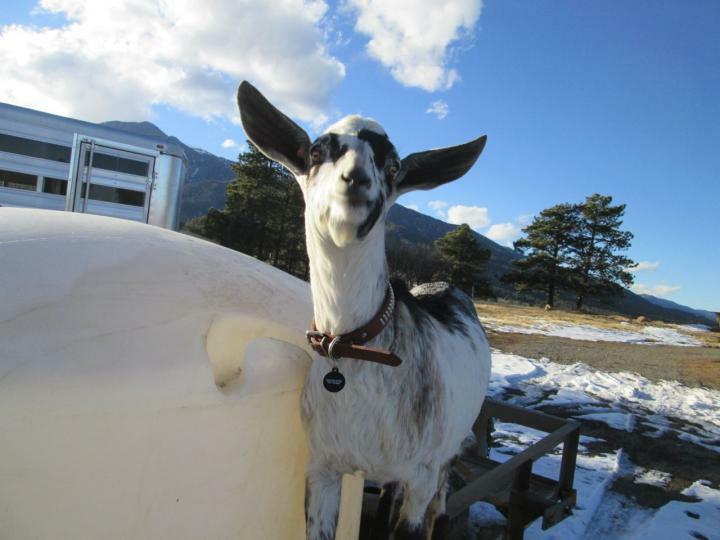 Everyone also got new ID tags for their collars since all the ones that aren’t missing are now scuffed beyond legibility, and half the goats never had them at all. Lilly doesn’t care for donuts, but she was happy to take a few animal crackers and pose for the camera. Nubbin did not come back into heat this week, so I’m keeping my fingers crossed that she’s bred. I’ll wait another cycle to be sure and then I’ll start drying her off. She’s still giving almost two quarts of milk each morning and looks great. While Nubbin looks more like her daddy than her mom, I still see Nibbles in the way she carries herself, her spunky take-charge attitude, and the kinked bottle brush tail. I’ve thought about Nibbles a lot lately because she died a year ago on December 17th. It was so sad to lose her the way we did, but good things grow out of ashes. 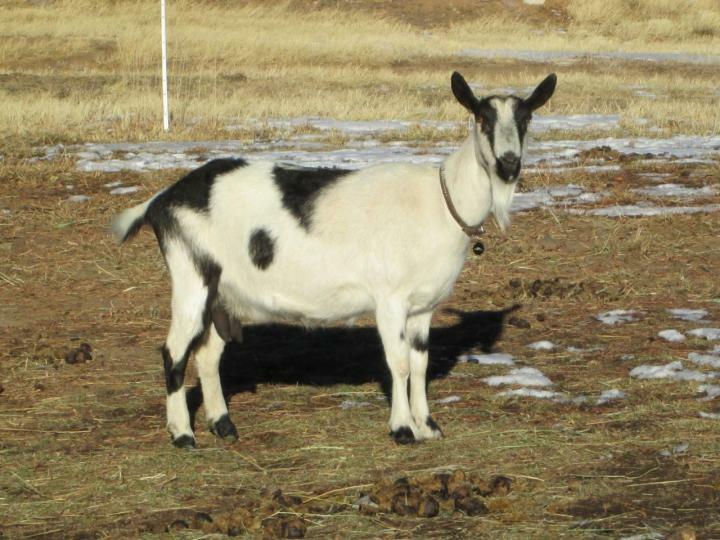 Because we lost Nibbles, we found an exceptional livestock guardian dog in Daisy; we bought Pac-Man to breed Nubbin and Petunia when we had planned to leave them open; and because of that we have Snickers and Sputnik. The three youngsters all got new leather collars to match Cuzco and Pac-Man. The old nylon ones were at their last stretch and getting tight. These have room to grow! Finn is almost as big as his mother now, but she still beats him up if he gets fresh with her or tries to boss her around. 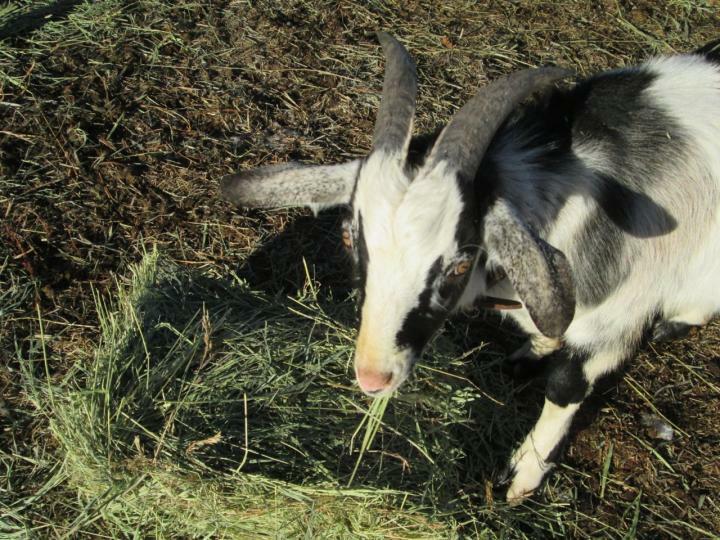 See the white streaks on the front of Finn’s horns? They’re getting more prominent as his horns grow, and they’re not rub spots. I made cajeta for friends and family members’ Christmas gifts today. I used brown sugar this time and I didn’t like it as much as the white sugar kind, but there’s no time to start a new batch. I made fudge the other day, and hopefully with 2-day shipping everyone should have their stuff in time for Christmas. It’s also a Christmas tradition for me to make our own cards, and I finally got those done this morning. 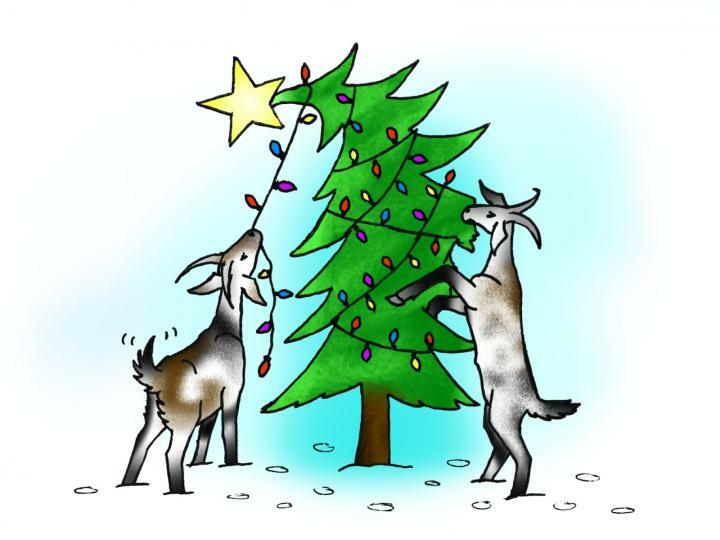 I drew a picture of two naughty goats savaging a Christmas tree. Phil colored them to look like Snickers and Sputnik. 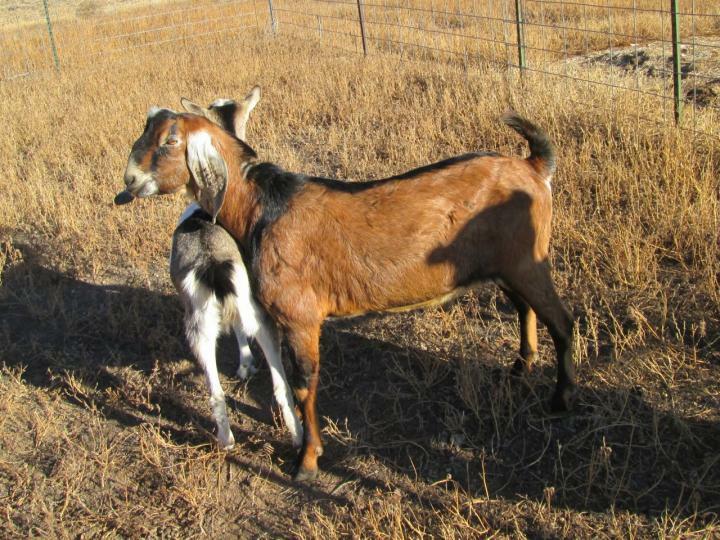 Also, I continue to be amazed at goats’ incredible breeding instincts. Delilah went to the buck on Friday, and yesterday she was still acting in heat. She’s usually my short cycle girl, but I guess her first encounter with a buck flipped some kind of switch inside because she was still in heat the next day and today. And today she was not just a little in heat–she was on fire! I let everyone out to graze except Jezebel and Delilah because I didn’t want Delilah and Finn together. 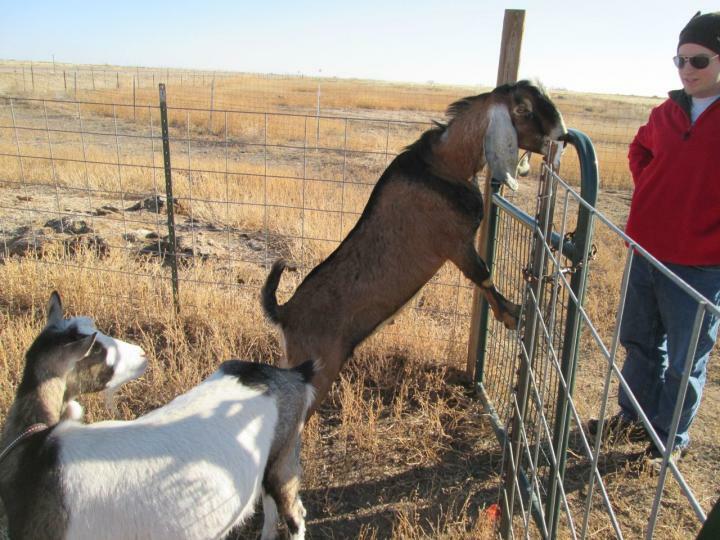 Finn was wooing her through the electric fence, but I didn’t think Delilah was desperate enough to try jumping over. Boy was I wrong! I don’t know how long they were out together before I noticed, but certainly long enough to have some fun. I ended up leaving Delilah penned on my basement patio where the gates are higher. Hopefully she took with the first breeding or we may have more little Finn babies than we planned on. Oh well. He’s a nice boy so it’s not a disaster if she ends up having his kids. Yesterday we took Delilah out for a date. This is a young son of Nubbin’s father and I like him better than his daddy (even if he is just plain brown). He’s long and tall and I’m told his mother has a gorgeous udder. I don’t remember his name–it was one of those weird names taken out of some B-grade fantasy novel, so Phil just called him “Chief”. Delilah liked him. I’m hoping she took. He was not quite as keen as I hoped he’d be and I think it was because he had been busy all day with the two girls he was penned with when we drove up. But hopefully he got the job done. 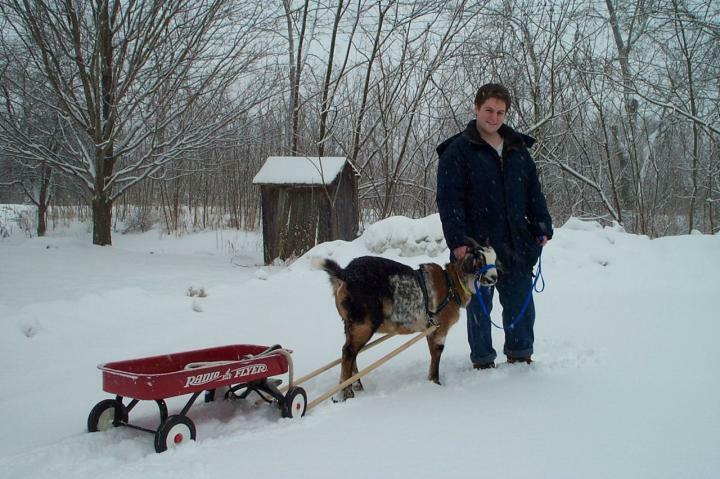 Here’s a photo from Cuzco’s first Christmas when I bought a Radio Flyer wagon and attached some shafts. We broke out the old horse halter again for a harness. 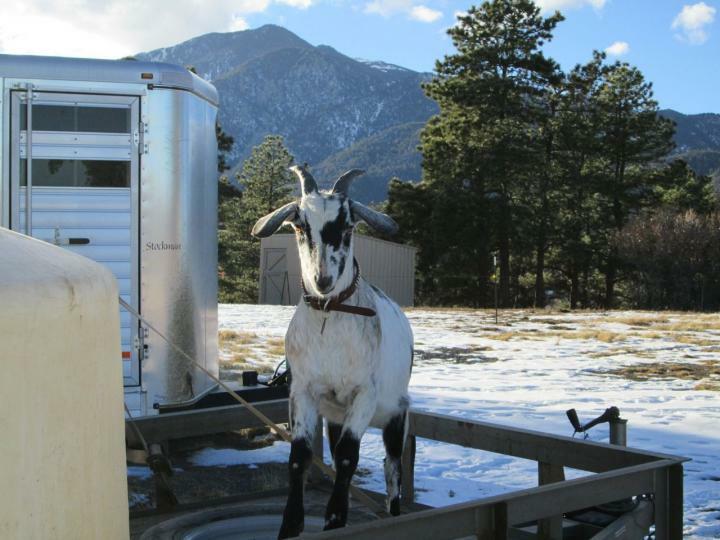 I soon learned that this is not a very good way to hitch a goat, but we had fun. I apologize for the lousy photo. I’ll try to explain what’s in it. 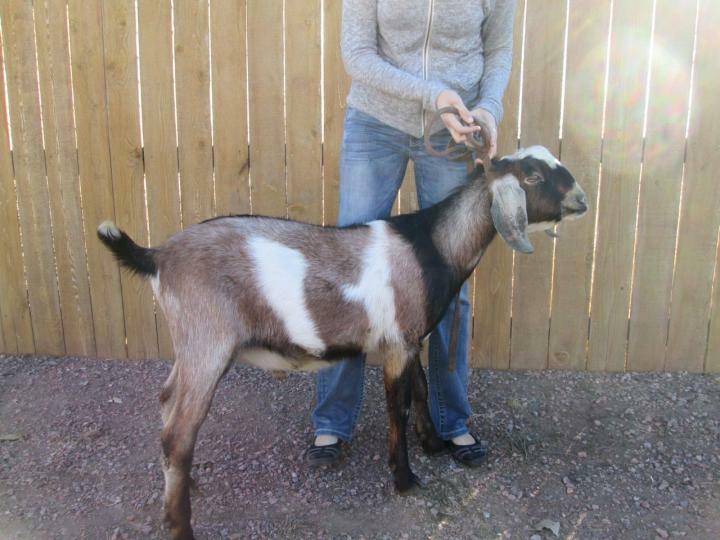 This is a candy cane decorated as a goat. See the little eyes and the brown pipe cleaner horns and ears? This is Cuzco. Phil and I made this ornament at a college Christmas party twelve years ago. It’s amazing it’s lived this long! Now look behind the candy cane. You’ll see it’s trailing what’s meant to be a tire. What inspired this? Well, I must go back twelve years to Cuzco’s first Christmas and recount a tale of an ignorant goat owner and a determined goat. 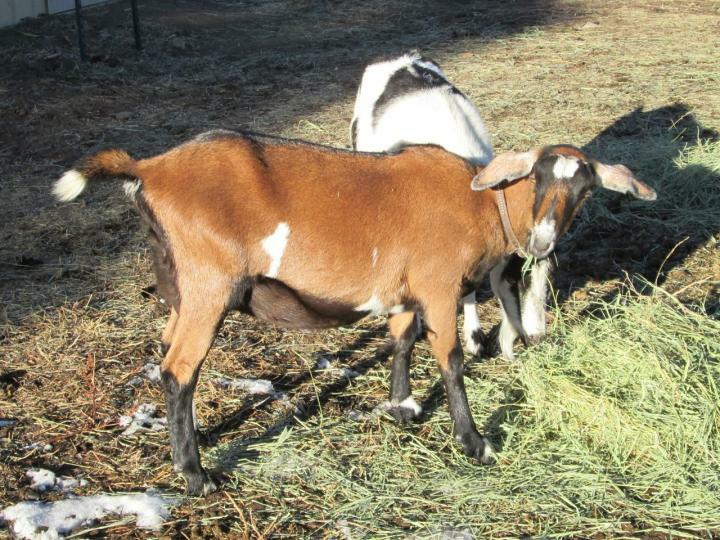 We didn’t own the barn where we boarded Cuzco and my horses, and the feed storage area was inadequate for keeping goats out, being just a section of the barn cordoned off from the rest with what amounted to a post-and-rail fence. 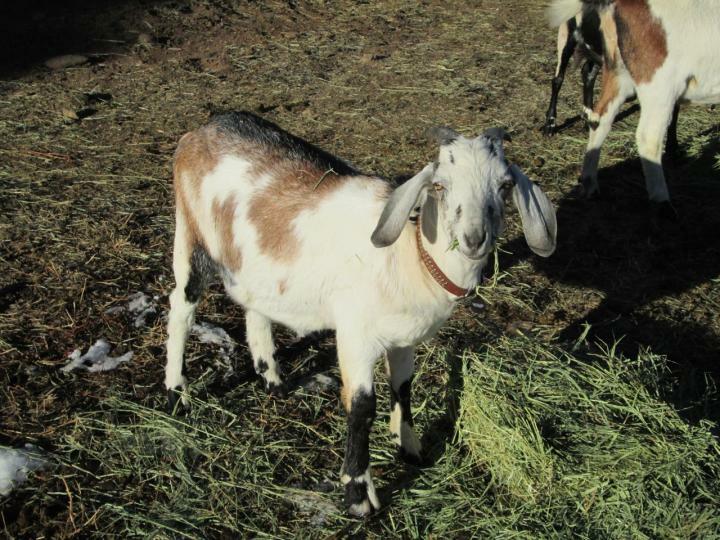 Goats are greedy little creatures, and Cuzco became accustomed to helping himself to grain whenever he felt like it. We tried every way we could think of to reinforce the barrier and to lock the grain bin. I tried several different types of trash cans and strapped the lids down in about a hundred different ways. It never took Cuzco long to undo my best work and I would come in to find grain scattered everywhere and Cuzco greeting me with an innocent look on his face. Several times it made him sick and I would find what looked like cow pies spattered all over the barn floor. He eventually learned not to eat so much it upset his tummy, but he still helped himself to more than was good for him. Finally, in desperation I resorted to The Tire. 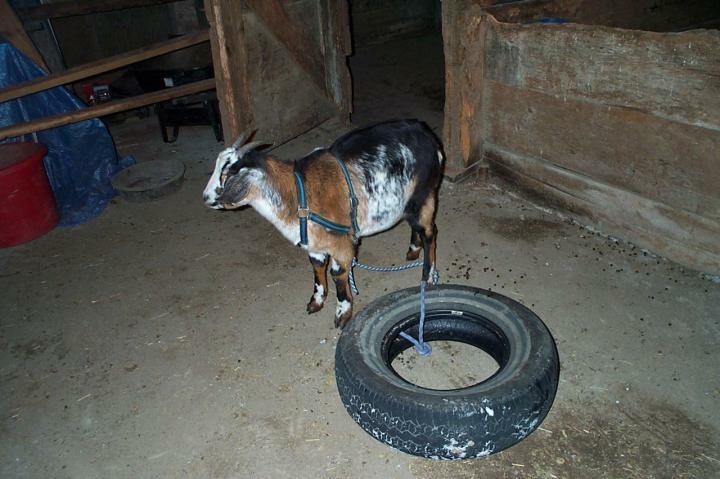 I found a discarded tire, dug out an old horse halter to use as a harness, and tied the goat to the tire with a piece of rope. My thought was that he wouldn’t be able to drag the tire through the fence. Amazingly, it actually worked! But while the tire kept Cuzco out of the grain, it also made him quite miserable, and it was not uncommon for him to get hung up on fence posts and other obstacles. He spent one cold afternoon shivering outdoors because he went under the pasture fence and came back on the wrong side of a post. 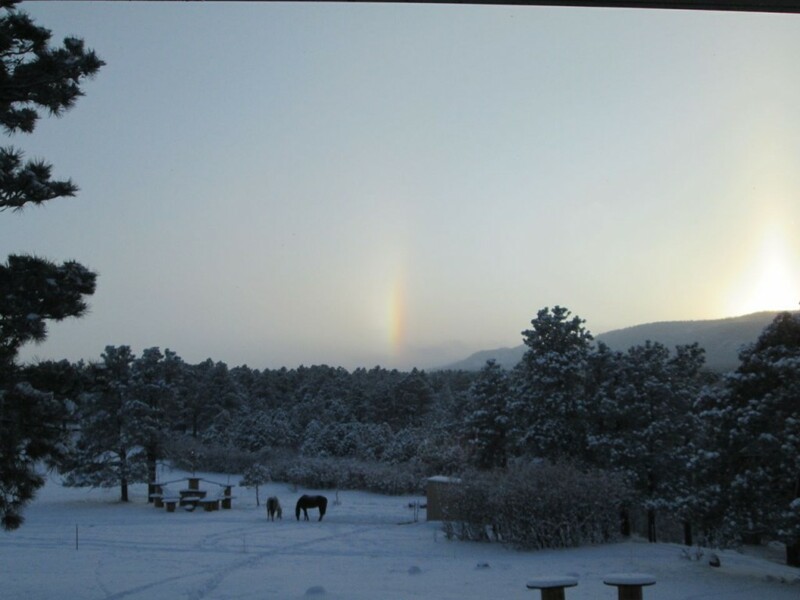 He stopped going out of the barn with his horse friends because he was afraid he wouldn’t be able to get back in. All told l I think the tire lasted about three days. I don’t remember how we eventually stopped the raids, but I think we may have simply given up in defeat and quit feeding the horses grain any more. Today I took Lilly to get bred, but unfortunately she went out of heat in the hour and a half between the time I left home and the time I got to the buck. I knew I was pushing the envelope a bit, but gee whiz, girl! Couldn’t you have held out just a little bit longer?? 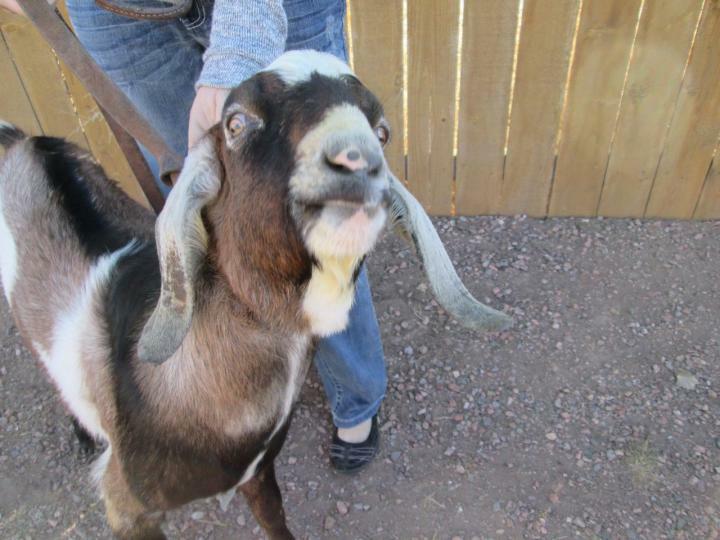 Lilly desperately needs to be bred to excellent udder bucks because hers needs help! She’s a phenomenal producer, but she hasn’t got the attachment for that kind of quantity! Isn’t he gorgeous? I can’t believe Lilly wasn’t smitten with this guy! I’ll take her back to him in three weeks when she cycles in again. And just for fun, he’s got the cutest little nose! 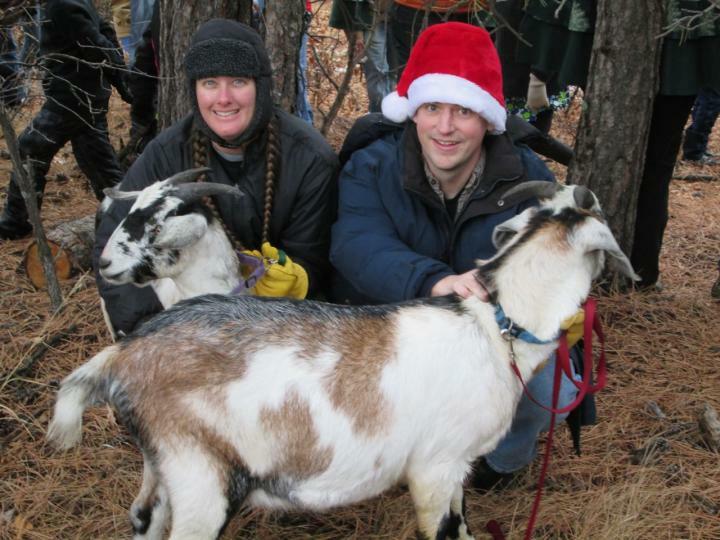 Yesterday Phil and I took Snickers and Sputnik to the annual Yule Log festival in Beulah. As expected, it was a total riot! What a fun event! The boys were a bit nervous at first, especially Sputnik who couldn’t stop shaking for at least the first half hour. He kept darting away from the people who wanted to pet him, but I would just hand them cookies to feed him and pretty soon he began to warm up to those nice strangers. 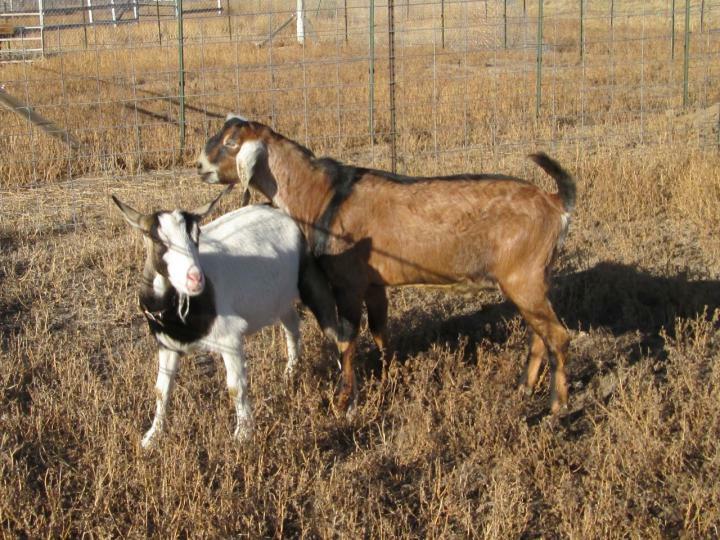 Neither of the goats was sure what to think of kids. “I didn’t know people came in our size!” But I’m not sure most of the kids knew what to think of the goats either. I realized after we got there that this was Snickers’ and Sputnik’s first outing among strangers. 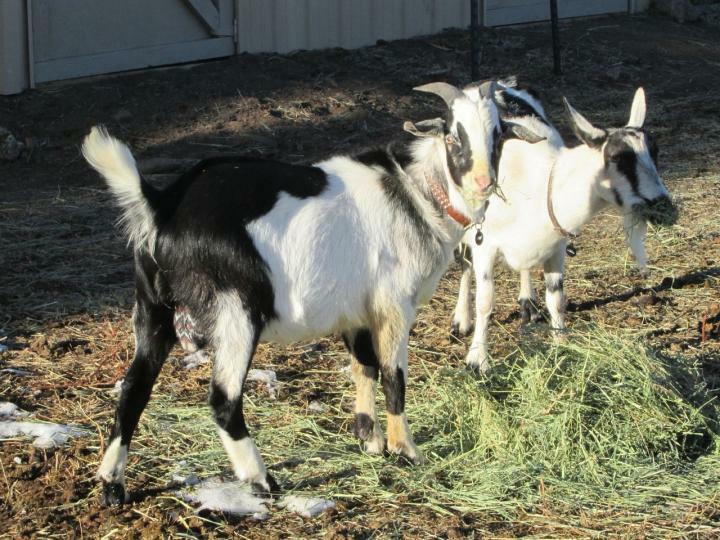 Nubbin and Petunia were much more relaxed when we took them last year, but they already had the State Fair, the Harvest Show, and a goat vacation under their belts by that time. We didn’t find the Yule Log ourselves, but we came really close! You can just see the end of it on the ground behind us. Once found, the Yule Log was dragged back up to the lodge with several kids riding on it. It was hilarious to watch since they occasionally fell off into the mud. Speaking of which, the festival had fewer people at it this year, probably because of the dreary wet weather and very little snow. 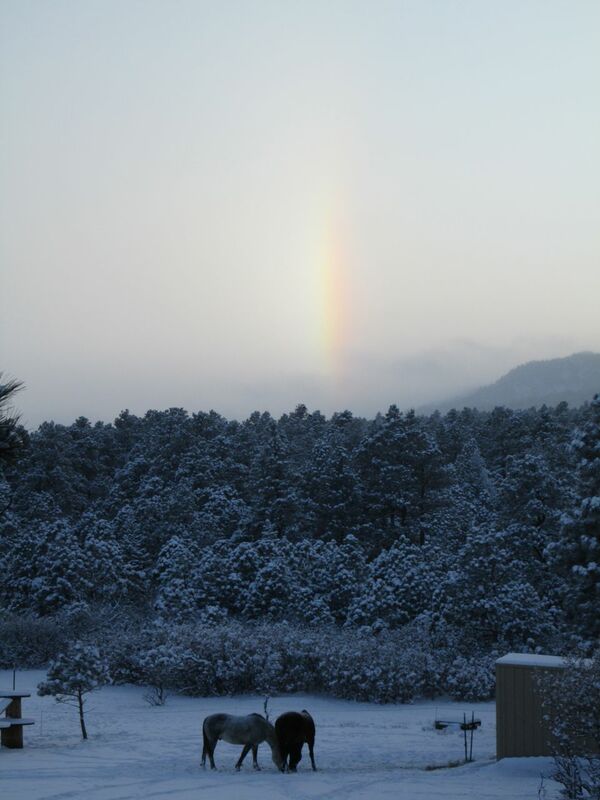 But that didn’t dampen our Christmas cheer! One of the ladies in charge was very disappointed we didn’t bring Cuzco with us. 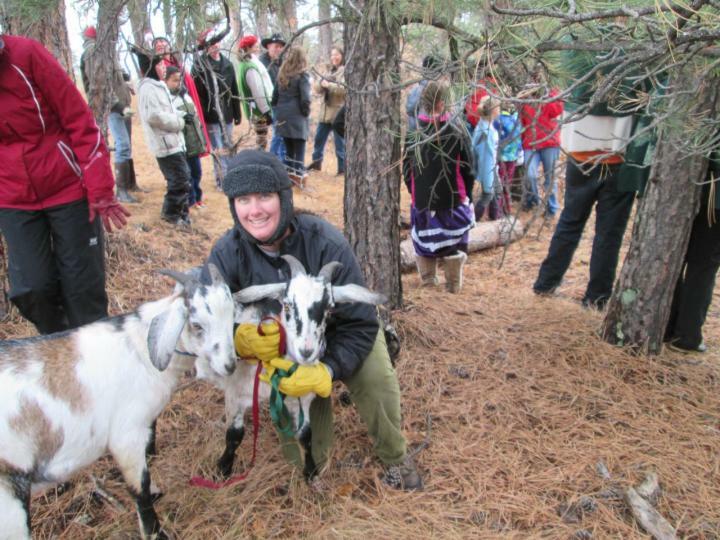 After seeing him in the parade the night before, she was expecting him to help pull the Yule Log back to camp. I told her maybe next year if he’s still up for it. 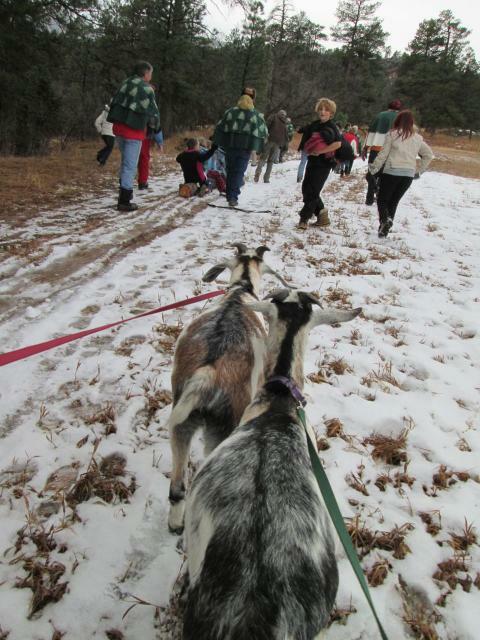 One day perhaps we’ll have a whole team of goats who can pull that logback all by themselves! It would be very Scandinavian. 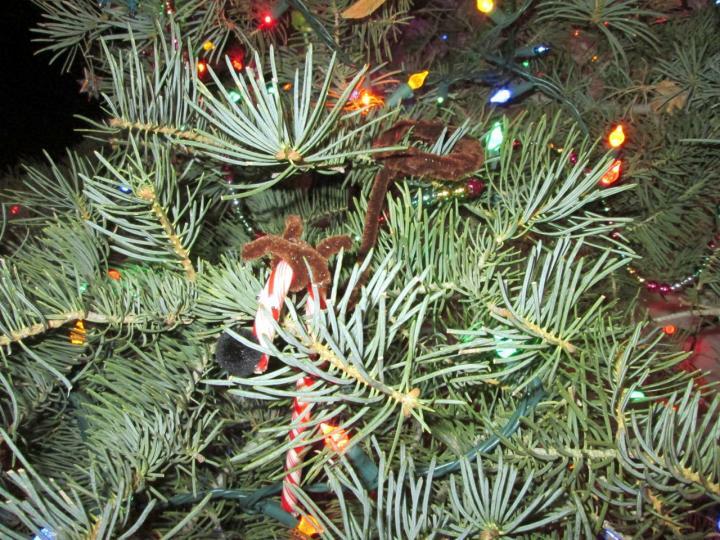 The Yule Log is, after all, a Scandinavian tradition, and goats figure prominently in Christmas festivities in those northern countries. 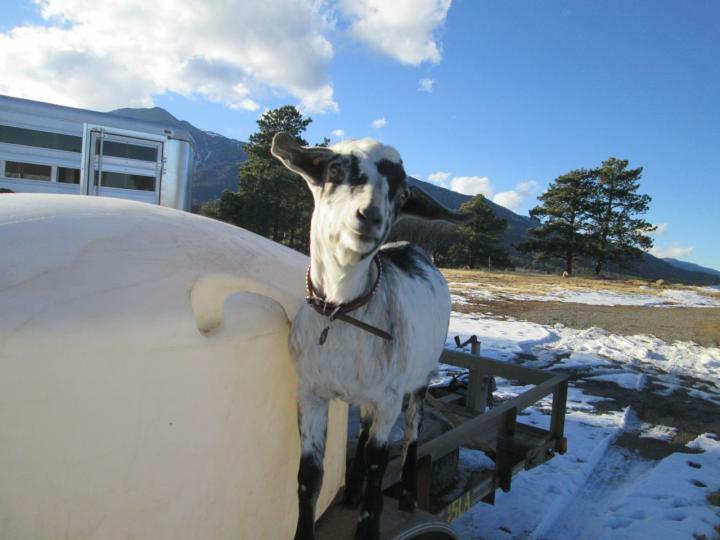 In fact, the Swedish Santa Claus rides in a goat-drawn sleigh, so having goats pull the Yule Log seems quite fitting. Tonight Phil and I participated in the Beulah parade of lights with Cuzco and Pac-Man. 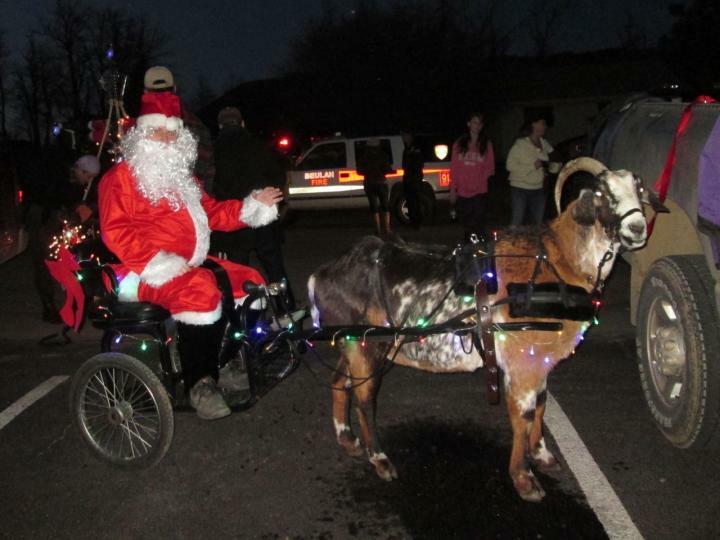 Phil dressed as Santa and drove Cuzco and the cart all decked out in lights! I led Pac-Man, who wore a packsaddle for the first time tonight. He wasn’t particularly pleased about it, but I think he was more upset about the lights and noises and strange people than anything else. He eventually settled down. This is the first time I’ve gotten to use my new Northwest packsaddle and Acid Rain panniers! I stuffed the main panniers with crumpled newspaper to make them look full, but the side pockets were filled with candy to throw. 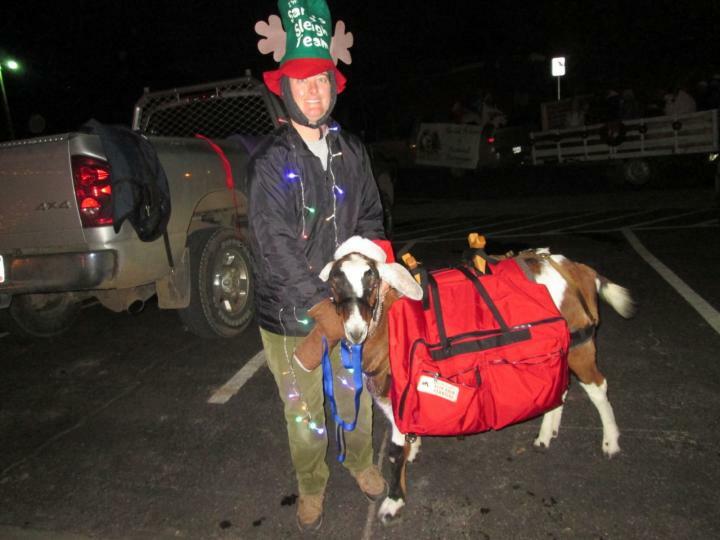 The goats enjoyed some chocolate before the parade. Cuzco was full of fire tonight! He nearly pulled Phil’s arms out the whole time. He was adamant that he was supposed to LEAD the parade! We made him stay behind me and Pac-Man. There was a pretty steep hill at the beginning of the parade and Phil asked me if he should get out of the cart and walk. It didn’t help. I think he’d have needed about three more people in the cart to make any difference. Because Phil was holding Cuzco back so strongly, he looked magnificent. He practically danced over the pavement. His feet barely appeared to touch the road he was so light on his feet as he pranced! Cuzco got a ton of compliments from the people as he went by, and afterwards Phil was told he and Cuzco were the highlight of the evening. Pac-Man was awesome for his first time out. He never once balked or dragged at the lead even though he was clearly nervous about the flashing lights and noises. I fed him a lot of cookies to convince him that we were in a nice place. Not only did he eat a lot of cookies and some candy, he also helped himself to my Christmas lights! Just as we arrived back at the staging area after the parade my light string went out and I looked down to see if the switch had gotten bumped. Instead, I just saw a pathetic piece of wire about a foot long hanging out of my pocket. Pac-Man had chewed my string cleanly in two, the little stinker!